Fly to Tachileik; Several airlines cover this route from Heho (Inle Lake), though not every day. The cheapest option is Golden Myanmar, at $55, significantly less than Air Bagan’s $130. From Yangon and Mandalay there are more alternatives. Walk across the bridge into Thailand: Stop at the beginning of the bridge to complete the paperwork with Myanmar border authorities, continue walking and do the same at the end of the bridge with Thai authorities. In most cases, no visa is needed to get into Thailand, so this takes less than a minute; but check the requirements for your nationality. Also, remember that Thailand and Laos are 30 min ahead of Myanmar time. Get from the border to the Mae Sai bus station: At the end of the bridge, take one of the red trucks to the bus station (~15 min). It costs baht 15 (~$0.5), you can ask the tourist police about where to find the truck stop and change currency in several shops around. We had gotten to the border rather late and wanted to make it to the bus station as soon as possible, so we jumped on a truck that was leaving without any local currency, and some super nice locals offer to cover our ride; we gave them our last kyats in return. Take a bus or similar from Mae Sai to Chiang Khong: The cheapest way to get to the Thai side of the border with Laos is taking a bus to Chiang Rai for bhat 39 (~$1) and from there another one to Chiang Khong for bhat 65 (~$2). 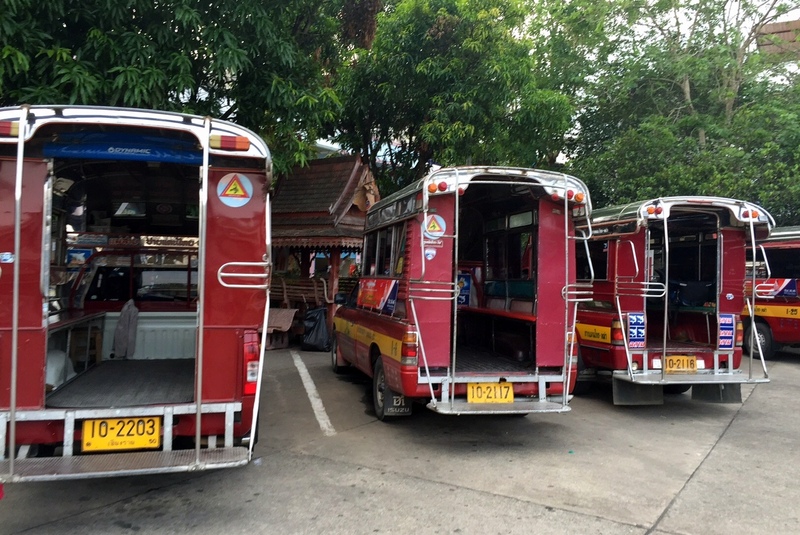 Each ride is 2-3 hours and if you arrive late to Mae Sai, it might mean you have to spend the night in Chiang Rai and, in low season, risk missing the slow boat on the Laos side. Alternatively, you can hire a taxi or truck to take you directly to Chiang Khong in less than 2 hours for ~$40 (to be divided by up to 6 people). If you have to spend the night there, because you arrive after the border closes at 6pm, there are several decent guesthouses and restaurants. Take a taxi or similar to the border Chiang Khong (Thailand) – Huay Xai (Laos): We simply walked out of our hotel in Chiang Khong and hailed a tuk-tuk truck, which drove us ~15 min to the border for bhat 100 (~$3 each, after negotiation). I imagine it would be similar if you are coming via bus from Chiang Rai. If you’re continuing to Luang Prabang on a boat, take a tuk-tuk truck to the harbor: Walk out to where numerous tuk-tuks are waiting and take a seat for kip 20,000 (~$2.5 per person, no negotiation). Slow boats cost kip 220,000 (~$25) and depart around 11am, once the tourists arrive form the boarder. They take two days to reach Luang Prabang, with an overnight stop in Pak Beng, so about 7 hours travelling each day. 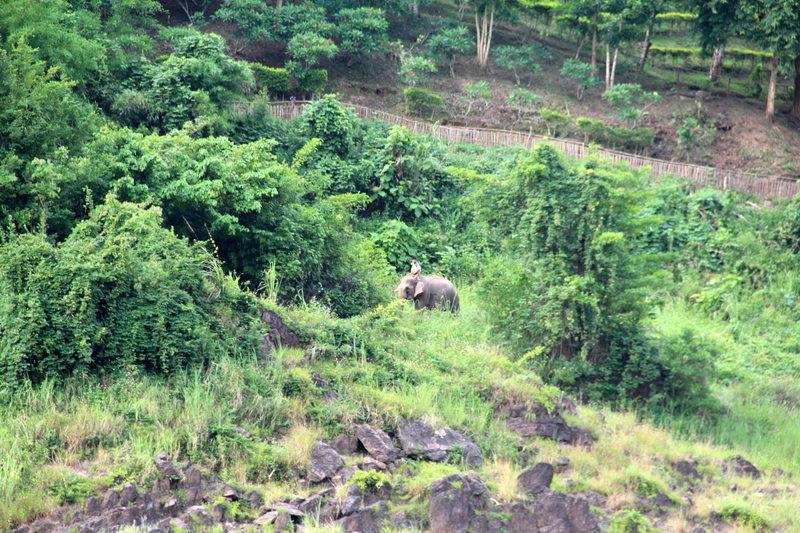 Despite it being a long trip, the comfort of the boat seats and the stunning Mekong scenery make it worthwhile… lush mountains, fishermen, bathing children and even some working elephants! In theory, this route can also be followed in reverse order. Myanmar border conditions change very frequently, and there is rumor of a direct crossing to Laos opening soon. So check this info with the authorities before departing. 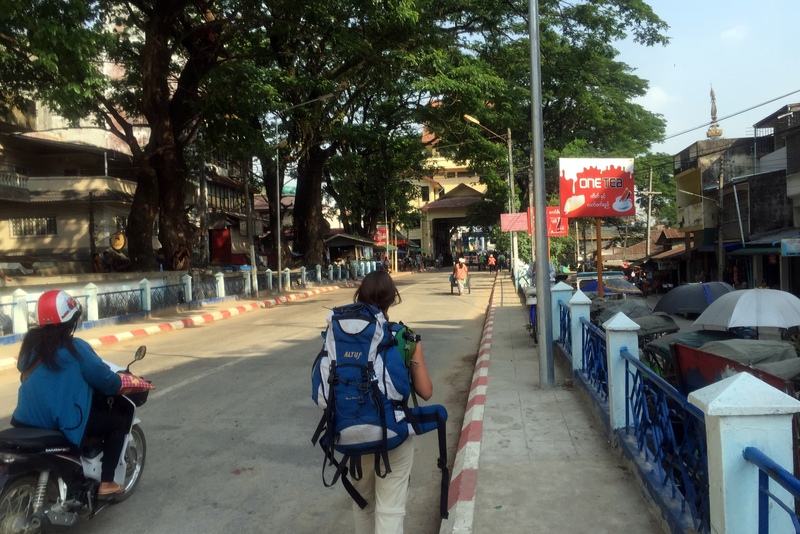 Hi Carmen, I am going Yangon by flight this Sunday and planning to backpack around 3 weeks and follow your route to LAos. Just wondering if you have to show the flight ticket to Tachileik at the checkpoint when you fly to Yangon airport? Thank you! I am still struggled if I have to buy it now because I am still not sure which date i will be leaving. Planning this journey in a month from now, heard anything that I should go or not go? I travel solo. great time to visit Myanmar, as they keep moving to democracy… You should be able to follow this itinerary on your own no problem. Hi Carmen, and thanks for the info! We are going to fly to Tachileik from Heho as well in a few days (as for january 2016 it is still not possible to take a bus on the NH4 to Tachileik for foreigners). One question though, how is it possible to get the 55$ rate from Golden Myanmar? The price for locals is close to $55, but for foreigners the airline charges $100 minimum according to the travel agencies. You’re welcome, Thibaut, and thanks for the update! Thanks a lot man! Very detailed. Hope there will be a direct way of crossing between them soon. Golden Myanmar will not let you pay $55, that is for locals, we must pay full whack $115, because of this you are forced into a travel office where you must pay cash only (With the blessing of GM) where you get ripped into by bad exchange and no change given so take in your currency converter and check and get your change. Their departure times and days have also changed. Going onto Luang Namtha..(NOT on the Mekong boat).by the time you get the bus over the bridge and passport checked into Laos and get to the bus station for going north, the bus leaves at 1230 getting into LM at about 1630, a terrific bus ride. I want to take the slow boat down the Mekong to Luang Pranang. is this possible from Myanmar or will I have to travel to Chiang Rai in Thailand and go from there? Can I get a Thai visa at the border as I cross? Unfortunately, there is no way to get from Myanmar directly to Laos, at least there wasn’t when we were there last year, due Myanmar’s political isolation… That’s why we had to do this long route. The visas were easy to get at the borders. 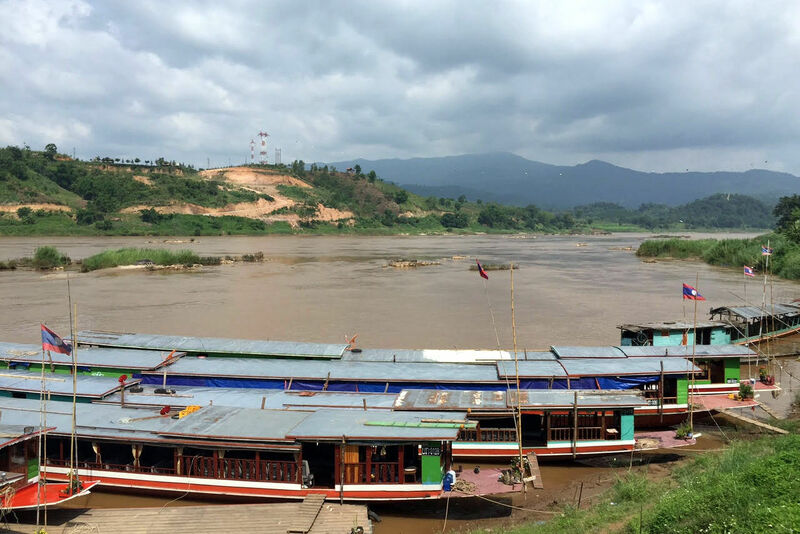 From Luang Prabang, any boat that goes west on the Mekong takes you to the Thai border at Huay Xai, from where you can get into Myanmar doing the reverse itinerary to the one explained in this post. I believe there are no options to travel by boat south on the Mekong. You can travel by bus or plane to Vientiane, but that takes you far from Myanmar, and to a different border with Thailand. During your crossing to Thailand, did they asked you, at the immigration, about how are you gonna leave Thailand? Or did you show any sort of details/bus tickets proving that you’ll leave Thailand? If I may? I followed Carmens’ clues to getting out of Myanmar into Lao from there .She was correct,, leaving Myanmar at this border ipost s no quick stamp and on your way, No, ten minutes or so on the departure side and quite thorough too. I cannot remember exactly ……. A brief update based on recent experience (22 december) : it is possible to cross over in 3 1/2 hours. Taxi from Tachileik Airport to the Thai border 4 USD per person (20 minutes) Taxi from the Thai side of the border to the Thai/Lao border 2 hours – 1300 baht. Most importantly, the border was still open at 8pm! Formalities quick. Last bus over the bridge (40 baht, 5 minutes) seems to leave at 8.30 pm. Tuk-Tuk to Ban Houayxay (20 minutes) came at 2500 Kip per person. Hi, many thanks for this useful article. I plan to go to Tachileik by plane from Mandalay. Then I’d like to reach Chiang Khong to take the slow boat down to Luang Prabang. My questions is : As the boats departure are in the morning (11am / 12am), is it possible to do the Tachileik/Mae Sai -> Chiang Rai -> Chiang Khong trip in the morning or is it better to do this the day before I take the boat ? I don’t think there is a flight from Mandalay to Tachileik early enough in the morning to allow you to do all the connections on time. You could sleep in Tachileik, I guess, and do everything else in the morning… but at that point, you’re better off sleeping in Chiang Rai or Chiang Khong (the first one is cheaper, it allows you to take public buses; the second one less risky, enables you to be at Huany Xai on time for sure).